In the latest update distributed to Office 365 tenants, Microsoft includes the ability to create an org-wide team, but only if your tenant has fewer than 1,000 accounts. The new feature turned up in my tenant on 9 October and is visible in Teams desktop build 1.1.00.26355. Editor’s Note: The limit for an org-wide team is now 2,500 accounts. An org-wide team is designed to facilitate tenant-wide communications for small to medium companies without the need for an administrator or team owner to manually add all the employees to the team membership, including the need to check for new employees and add them periodically. As we explain in Chapter 14 of the Office 365 for IT Pros eBook, the process of creating a team and populating its membership with PowerShell is not difficult, but some work needs to be done to maintain the membership afterwards. To create an org-wide team, choose Join or create a team as usual, and then select Org-wide from the Privacy drop-down list (see below). The choice only appears to global admins (for the Office 365 tenant). Service accounts (if they have an Office 365 license). Mailboxes used for purposes such as DLP incident reports. These accounts might be licensed, but they shouldn’t really feature in a team. Accounts that have an Office 365 license but the Teams option is disabled. Because some odd results can turn up in the automatically-generated membership, it is good practice to check the membership after the team is created and remove any account that doesn’t belong. Likewise, if you find that an account that should be in the membership has been omitted for some reason, you can add them manually. And like for any team with a large membership, consider updating team settings to stop members posting in the General channel, adding channels, or even using @team mentions (because they generate notifications for everyone in the team). On an ongoing basis, employees leave and join the company and people lose or gain Teams licenses. When someone leaves the company and their Office 365 account is removed, their membership of the team is also removed. To handle new joiners and people who gain or lose Teams licenses, a background process scans the accounts in the tenant periodically (expect weekly) and adds or removes the user as required. Unlike normal teams, members can’t choose to leave an org-wide team. One odd thing I noticed about the people added to the org-wide team membership is that if an account does not have its Office 365 license listed first in the set of product licenses, that account is ignored. Take the example of the Kim Akers account shown below where the first license is for EM&S. This account is not added to the org-wide team. If you already created and use an all-employees team without benefit of Microsoft’s new feature, a tenant administrator can convert the team into an org-wide team and gain benefit of the automatic membership management. To do this, select the team you want to convert and then use the Edit team feature to change the privacy setting to org-wide. When you save the setting, Teams updates the membership with all valid accounts. Any users not included in the automatic membership remain in place, including guest users. You can also change an org-wide team to be a private or public team using the same approach, and in this case, the existing membership stays in place but the automatic background refresh of membership is disabled. Using dynamic Teams to support discussions for different parts of the organization. For example, you might have a team for each department or each country. Using Yammer for company-wide communications and collaboration. Yammer can easily scale up to handle very large organizations with hundreds of thousands of users. Remember, a team can support up to 2,500 members, so you can always use PowerShell to generate and manage an org-wide team if your tenant falls between 1,000 and 2,500 accounts. We have over 80 pages of content about Teams in Chapter 13 of the Office 365 for IT Pros ebook. 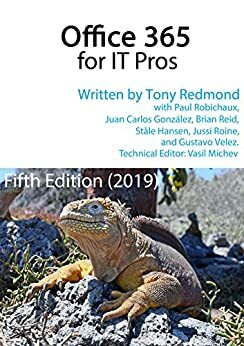 And then even more when we discuss using PowerShell to manage Teams and Office 365 Groups in Chapter 14… and more about Teams Meetings and telephony in Chapter 16. In short, we have lots of Teams content for you to read. The latest PDF version is available at gumroad.com? Of course. See https://office365foritpros.com/faq/ for information about how to get the latest version of the files from your Gumroad account. The information in this post will be included in the October 19 update along with all the other snippets, insights, and new information that we’ve learned about Office 365 since the September 20 update.